Social networks influence parenting by modelling what works, persuading their friends to persist when parenting gets tough, teaching knowledge and skills, and by giving emotional support within the context of community and neighborhood. The influences of social networks on parenting are explained from the Developmental Psychopathology interdisciplinary field of human development, and specifically the theories of Urie Bronfenbrenner, Jay Belsky, John Bowlby, Mary Ainsworth, and Albert Bandura. 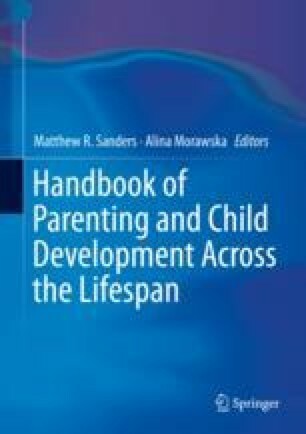 This chapter explores five domains of research connecting social support and parenting: (1) intergenerational transmission of parenting; (2) community and neighborhood; (3) marriage quality; (4) grandmothers; and (5) offline and online friends. Inside these domains, we discuss two overarching mechanisms of how social networks influence parenting: (1) indirectly, family and friends promote the parent’s emotional well-being; and (2) directly, social networks promote parent’s self-efficacy through mastery experiences, social modelling (including conveying knowledge and skills), and social persuasion—embedded in a community of social capital and shared beliefs.